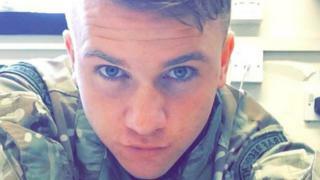 Officers searching for missing RAF airman Corrie Mckeague have resumed their examination of a landfill site. Mr Mckeague disappeared on a night out in Bury St Edmunds, Suffolk, in September 2016, when CCTV showed him entering a bin loading bay. Suffolk Police called off a 20-week search for his body at the landfill in Milton, near Cambridge, in July. The force has embarked on an "extended search" which is expected to last four to six weeks. Officers will concentrate on an area next to the original search site which police say is "the next most likely area" where Mr Mckeague's remains may be. Mr Mckeague, from Dunfermline, Fife, who was 23 when he went missing, was last seen at 03:25 on 24 September 2016. He had been on a night out with friends from RAF Honington.